The Event Counters window displays cumulative numbers, which show how often an event triggered. 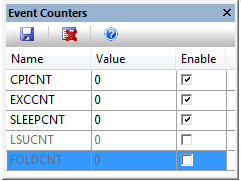 Open this window through View - Trace - Event Counters. For more information, refer to the Event Counters documentation.